Who says you can’t have stuffed peppers when you are on a keto diet? 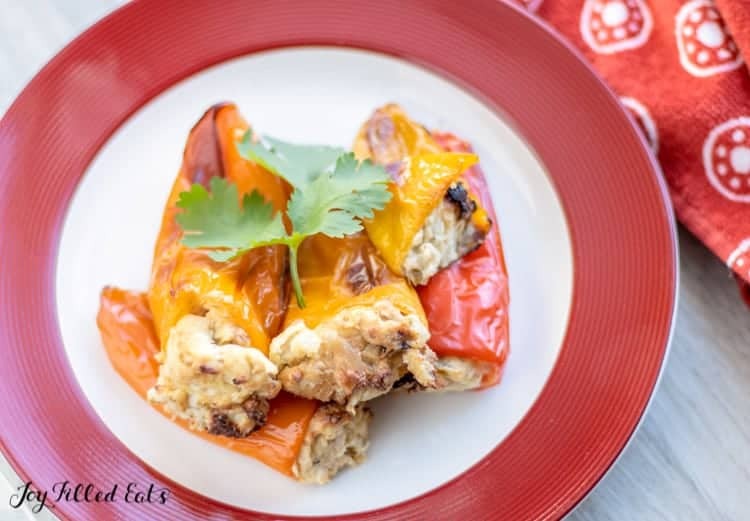 Check out my keto stuffed peppers, that will knock your socks off in flavor! 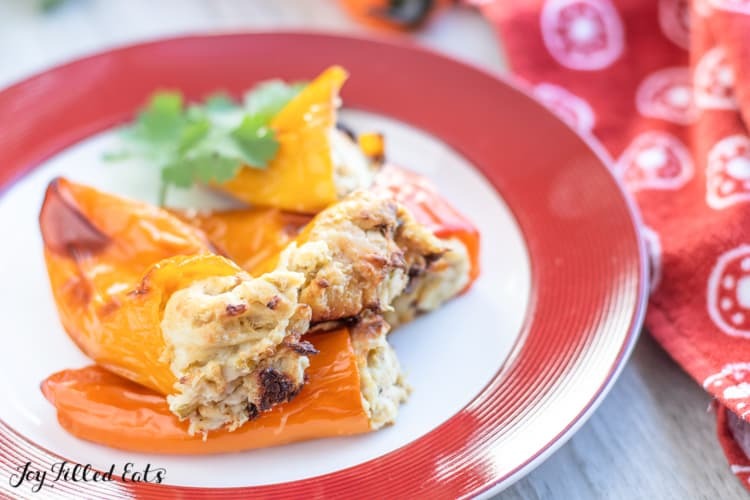 Sweet stuffed peppers with chicken, green chilies, and cream cheese! Easy to prepare, and downright delicious to serve up. Mini stuffed peppers are such a fun way to serve up your guests or family. 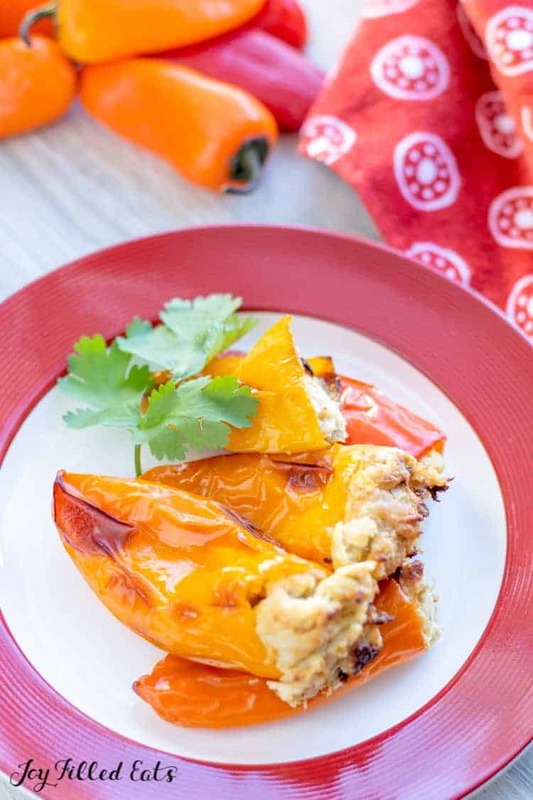 When the warmer weather arrives, these stuffed peppers without rice are my go-to! There is so much flavor, that you don’t even want the rice. You won’t feel heavy afterward, and you can go about the rest of your day feeling great. 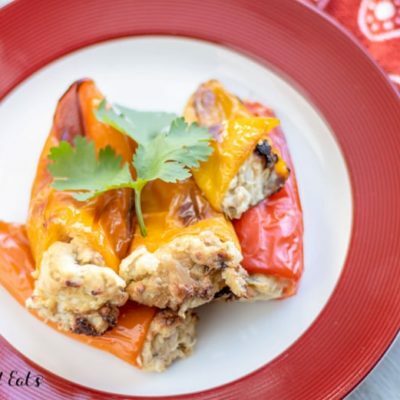 To make these stuffed peppers even easier, I reached for leftover rotisserie chicken! That is right! Grab last nights chicken and use that so you don’t have to cook up any chicken for this dish. 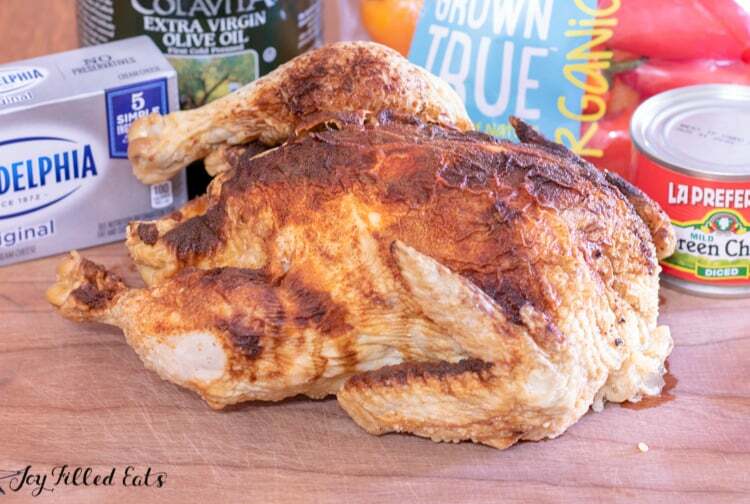 Whether you make homemade rotisserie or pick it up at your grocery store, either route works. You can totally improvise and reach for another type of chicken. You could do shredded chicken in any form. So if you need to cook up a few chicken breasts, and then shred and use. Or pull the meat off the bone from your bone-in. If you happen to have another cooked chopped, shredded, or crumbled meat (leftover taco meat for example) on hand, feel free to reach and replace it with shredded. I have not tried this method, but I am sure it will work just as good! If you want to go the other route and use regular bell peppers instead of mini stuffed peppers, feel free. You will need to double the recipe to make 3-4 peppers, where this recipe will do around 1-2 peppers depending on their size. I find the minis are a perfect size, and they are great for serving at parties and cookouts in the summer months. You simply want to clean and prep your peppers as directed below. Then in a bowl create your filling of chicken, cream cheese, and green chilis. Then stuff each pepper and sit on a baking sheet. Pop in the oven and let it cook up till the peppers are tender and the cream cheese melts. The reason your cream cheese needs to be softened for stuffed peppers is that it is a tougher consistency. If you want to create a really creamy texture, you need to have it warmed at room temperature. If you forgot to set your cream cheese out, no worries. Simply place your cream cheese in the microwave and heat on high for 20-second intervals. Stir between each use until you see your cream cheese is softening up. You don’t want to melt it, just make it easier to blend with the chilis and chicken. As you can see this recipe is so simple to make. 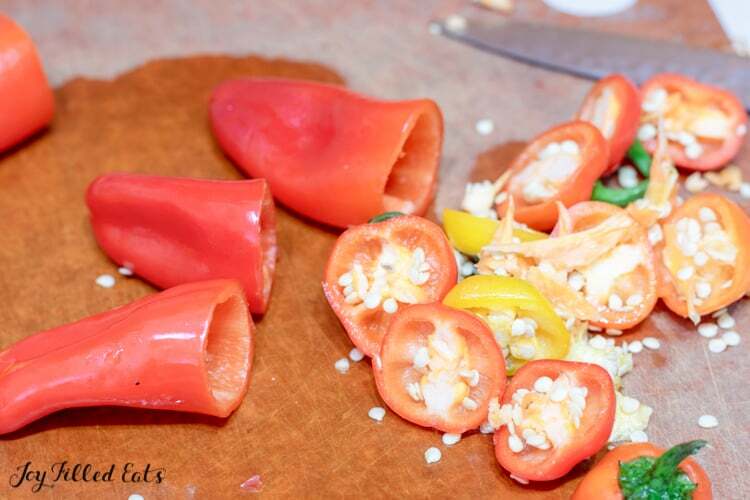 Mini stuffed peppers are going to be a fun dinner idea or appetizer for you and your family. Pair with your favorite side dishes or a handful more of low carb appetizers and enjoy. I know our family loves this recipe, and we make it quite often. You can freeze stuffed peppers, but I will note, that they will become really soft once you pull from the freezer. The peppers will break down quite a bit when they are frozen, so you will want them to be laying flat so you can grab and transfer to a baking sheet to cook. If you happen to have leftover keto stuffed peppers, simply place in an airtight container or cover in a dish and toss in the fridge. You can keep these peppers up to 1-2 days, and then they will break down enough they will need to be tossed out. To reheat you can warm in the microwave or even the oven. Just note that leftover stuffed peppers will be a lot softer in texture, and the sooner they are eaten the better. Who says you can't have stuffed peppers when you are on a keto diet? 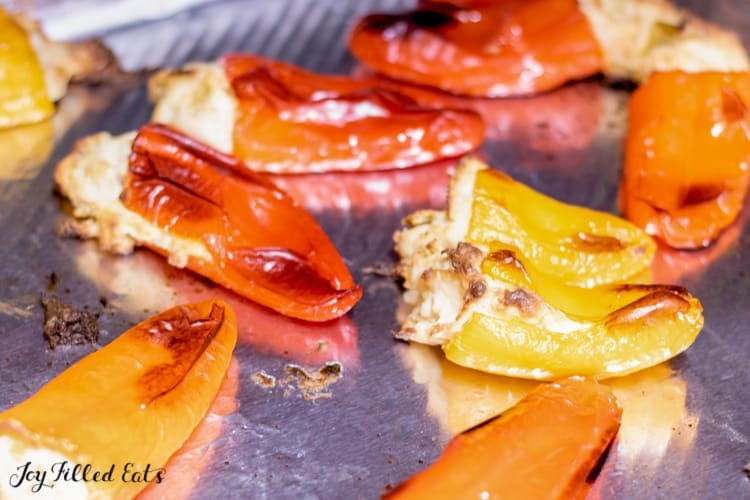 Check out my keto stuffed peppers, that will knock your socks off in flavor! 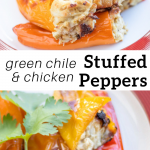 Sweet stuffed peppers with chicken, green chilies, and cream cheese! Easy to prepare, and downright delicious to serve up. Preheat oven to 400 degrees. Cover a large baking sheet with foil. Cut tops off of peppers and de-seed. 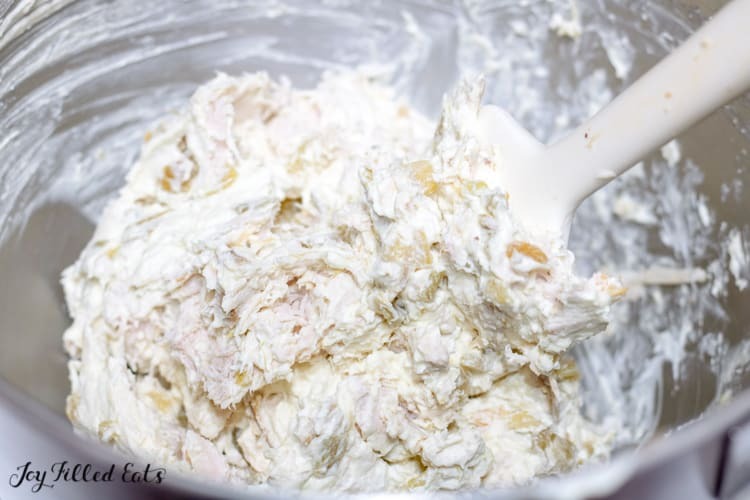 In a mixing bowl, beat cream cheese until fluffy. Beat in the entire can of green chiles, undrained. Gently fold in chicken. Stuff peppers with chicken mixture. Coat the stuffed peppers in olive oil and place on baking sheet. Please note that some filling may come out of the peppers during the baking process. Using a spoon, the filling can be pushed back into the peppers gently prior to serving. Oh man these are so fun and easy to make! Thank you! This is so delicious and so easy to make, love it!